How Does the GSV Carnival Series Work? Girls Sport Victoria conducts a series of Swimming and Diving, Cross Country and Track and Field Carnivals in Terms One, Two and Three, respectively. In the lead up to these Carnivals, schools conduct specific training and may also attend a number of ‘training meets’ with several other GSV schools. Schools then compete in one of three GSV Preliminary Carnivals. Schools are allocated to a specific Preliminary Carnival based on their result from the previous year, with the aim of having an even spread of strength across each of the Preliminary Carnivals. The winning school from each Preliminary Carnival is automatically allocated into Division One. Based on combined data from all Preliminary Carnivals, the next best five schools are allocated into Division One, with the following eight schools allocated into Division Two and the final eight schools competing in Division Three. While schools may fine-tune their team lists from Preliminary to Championships, in most instances girls represent their school in both Preliminary and Championship Carnivals in the same events. Once the three Championship Carnivals for Swimming and Diving and Track and Field are held, the GSV office compares the times, heights, distances etc of each competitor (by age group) and the best eight – ten girls are invited to compete in the prestigious GSV Finals Evening. 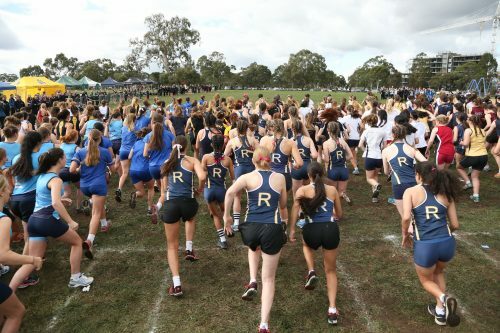 Cross Country is slightly different because at the Championship Carnival, competitors from all three Divisions run against each other at the same time. Recognition is given on the day to the top ten runners across the line as well as top 10 in each Division.